Dr. Pershad and his friendly team use a wide variety of treatment options to help patients of all ages obtain the straight and beautiful smiles they deserve. A growing number of the patients we see are adults seeking braces and it's no wonder, as today there are many treatment options which are ideal for adults. Many adults have come to realize that wearing braces offers many significant benefits, both socially and professionally. It's never too late to improve your smile with orthodontic treatment as healthy teeth can be moved at any age. However, orthodontic treatment for adults is different in two main ways: First of all, adult jaws are fully developed, so changes in actual jaw structure with will be minor compared to growing children. Secondly, gum disease is more common among adults than children. Because periodontal health plays a key role in the gentle forces used to shift your teeth, your gums must be healthy before orthodontic treatment ensues. This means that all levels of gum disease must be treated and controlled before orthodontic treatment can begin. Traditional Metal Braces — Conventional metal braces are the most common type of braces made from high grade stainless steel. The brackets on these braces are bonded to the front side of the teeth and have an archwire running through them to gently move teeth. Today's metal braces are smaller, more comfortable and more attractive than the metal braces used in the past, making them popular among adults and youngsters alike. Clear Braces — Clear braces are similar to metal braces except the brackets used with clear braces are made of a translucent, ceramic material. These braces are very discreet as they are hardly noticeable except for the thin archwire running through the brackets. 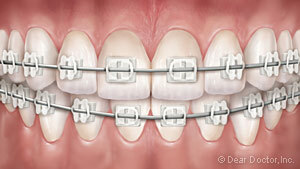 These braces are not as durable as metal braces as the ceramic material used makes them more susceptible to breakage. Clear Aligners — Clear aligners are clear plastic ”trays” that fit closely over the teeth. This orthodontic treatment option consists of a series of these trays with each set designed to be worn for a period of about two weeks. You wear the first set of aligners in the series for approximately two weeks, then move on to the next set and so on until your orthodontic treatment is complete. The clear aligners are removable which means you can take them out when eating & drinking and when brushing & flossing your teeth. 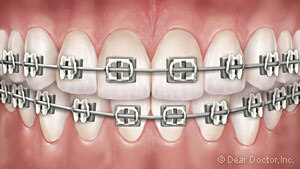 Lingual Braces — Lingual braces are bonded to the lingual or tongue side of your teeth so that no one can see them. Many adults who don't wish to wear highly visible braces choose lingual braces. However, these braces can be more difficult to get used to wearing and they are more costly than conventional braces that are worn on the front side of the teeth. When you are done wearing your braces or clear aligners, you will begin the retention phase of your treatment. 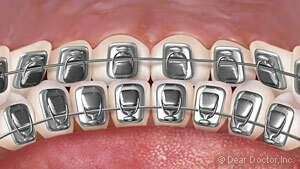 This is when you will wear a retainer that is designed to hold your teeth in their new positions. 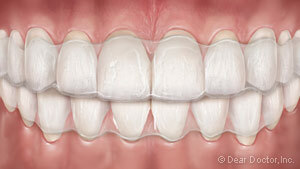 It is important to wear your retainer as directed so your teeth do not move back into their original positions. Niagara Peninsula Orthodontics is proud to provide quality orthodontic care to patients of all ages living in Niagara Falls and the surrounding communities of St. Catharines, Fonthill and Beamsville Ontario. If you're an adult who is interested in finding out what types of Niagara Falls braces are right for you, please contact us today to schedule an appointment time. Dr. Pershad will work closely with you to help you choose a treatment option that both meets your orthodontic needs and fits into your lifestyle!